Following in the footsteps of Coachella, the 12th annual Austin City Limits (ACL) Music Festival doubled its attendance at Zilker Park this year by expanding its usual three-day concert to two identical lineups on consecutive weekends in early October. For sound reinforcement duties on one of the festival's largest stages--known as AMD on the first weekend and Lady Bird on the second--Houston-based LD Systems chose to deploy a full L-ACOUSTICS K1 loudspeaker system. Out of the more than 140 groups performing at this year's ACL Music Festival, AMD/Lady Bird hosted some of the biggest headliners, including Depeche Mode, The Cure, Vampire Weekend, fun., The National, Passion Pit and Atoms For Peace, featuring members of Radiohead, Red Hot Chili Peppers and Beck. According to LD Systems Director of Production Services Robert Ausmus, the stage was equipped with a total of 24 K1 with six KARA for downfill, plus 24 KUDO for out-fill and six additional KARA for apron-fill. Low frequencies were delivered via 24 flown K1-SB and 24 ground-stacked SB28, while 18 KUDO divided into three towers 250 feet out from the stage provided delay. LA8 amplified controllers housed in LA-RAK touring racks drove all systems. "For huge outdoor festivals like this, there's nothing better than L-ACOUSTICS' K1 because of its incredible throw capability and sound," Ausmus said. "ACL capped its audiences at 75,000 per day, but when big headliners like Depeche Mode performed, literally 90 percent of the day's crowd showed up at our stage. The people at the back end of the park weren't getting 'in-your-face' audio, of course, but the good news is that they did hear highly intelligible music, which is amazing at that distance." 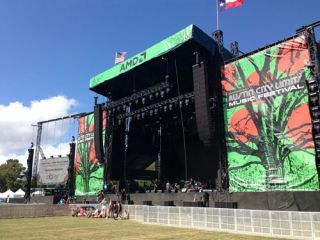 LD Systems' affiliation with ACL Music Festival goes back to the very first event in 2002, but it was the sound reinforcement provider's deployment of a KUDO system at August's Lollapalooza in Chicago that convinced Austin-based C3 Presents--the producer of both festivals--that L-ACOUSTICS' flagship system would be the right choice for the AMD/Lady Bird stage.